It was literally a Big event - more than 50 teams across the country displaying their entrepreneurial skills in a Business Plan competition. Yes, The NMIMS Bulls were there too. There was a ultra-strong Financial Planning (courtesy the CFO - Ankit), a wide and ‘real’ information of the operating costs prevalent in the market by the COO (Rahul), a decent marketing plan (CMO – me!!) and constant motivational doses and guides by our CEO and HR head..(Sreejith). The prize was Big – cash prize and a chance to be funded by the National Innovation Foundation (NIF) to actually start the business. The first stage was cleared and top 16 teams were invited to present their B Plan at SP Jain Institute of Management and Research. Of course, we were there otherwise I wouldn’t have been writing this piece. Our CEO presented the plan in front of Financiers from Dena Bank, Member of NIF and Faculty of SP Jain. And not surprisingly we were there on the podium. 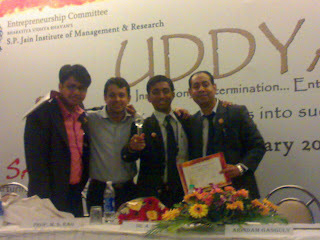 We stood second and our team was selected for incubation of the project. Though incubating the project is complex and requires much more effort from our side..Hope we live up to it..
na kaka kehta hai ki main apni company kholoonga jo hai, na kaka padha hai ki suna? sid: saar zee, kiya hai..
@shantz: Long time dude.. how have u been.. so back to blogging..! sid beere, hum to have been good, tu bata..